Abstract:Construction of high-level universities, the construction of the campus information system is an important part. Due to the increasing number of the current college students, office range continues to expand employment increasingly heavy task, the amount of data increasing, but the data split, merge, very difficult, in the face of these enormous task, not any one person may be completed within a short period of time in a computer thing, so to improve the stand-alone employment before the inadequacies of the information management system, the development of the network version of the job information Management System, the true realization of large-scale, multi-user work together to improve office the work efficiency and reduce the error rate of the data. Graduates query management system prototype for the research and development of Web technology and asp.net combination gives the asp.net process definition language and workflow execution machine-based design and implementation. Equipped with a sophisticated user name and password authentication processing, space quotas functions. The program also uses a SQL database technology, to make the system more powerful. 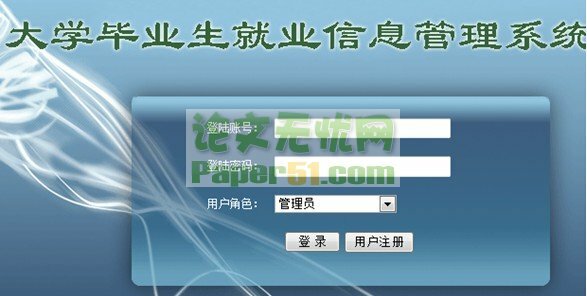 The main entry of student information, employment information and browse the query function, administrators can statistics student employment situation. This system has many characteristics: the system is fully functional, easy to use simple, intuitive user interface, security settings are complete, greatly reducing the workload of operators and users.